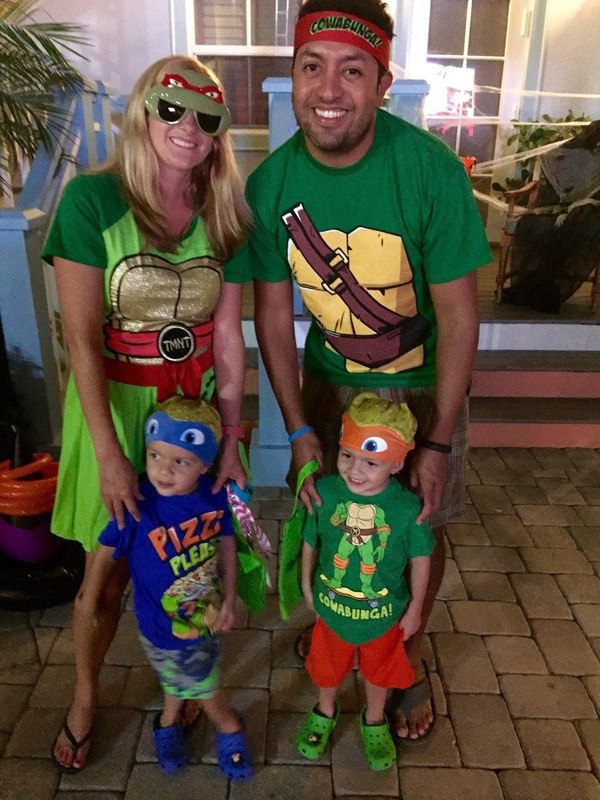 My favorite holiday has always been Halloween from dressing up as a kid, to donning dorky couples costumes with my husband and now dressing up as a family for a fun night of trick or treating. However, as much I’d love to be the mom who makes her children a homemade costume, that just ain’t me. Fortunately, this year Party City and Chuze made it easier for us. Party City’s easy Make Your Costume Mix and Match sections allowed us to go outside the typical pre-packaged costume to customize based on each member of our family. Chuze meanwhile is a FREE shopping app that creates exclusive bundles of coupons that go together. Every time one goes live on the app you'll get an email inviting you, so you won't miss a thing. An exclusive Party City coupon launched this week for last minute holiday shopping. I ended up saving $20.99 on my haul. 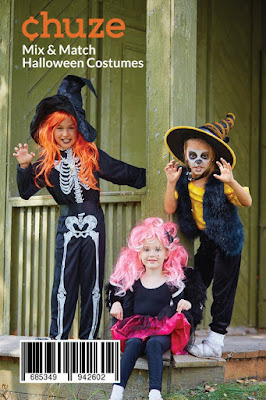 To save simply click on the image below and download the PDF coupon for printing and bring to your local Party City store OR enter HALLOWEEN BUNDLE in the search bar of the app to get 20% off $70 or more at Party City expires 10/31/15. Have fun shopping! With my husband named Raphael, we naturally went with a Teenage Mutant Ninja Turtles theme this year. 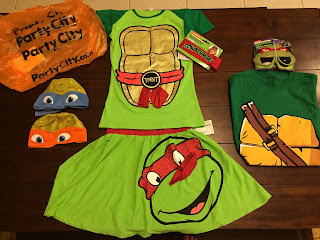 I selected a fun glittery TMNT skirt for women and matching top (I decided not to grab the tights though); a t-shirt for my husband with matching Ninja Raphael sunglasses instead of the typical eye mask; and two cute toddler hats for my twin boys that I’ll pair with TMNT shirts that they already own from The Children’s Place. They had fun green turtle hands too, but I knew they wouldn’t stay on their quick paws for more than 30 seconds, lol. Best of all, I got all four outfits, plus accessories for under $85 and had a blast selecting the different items and customizing our looks. 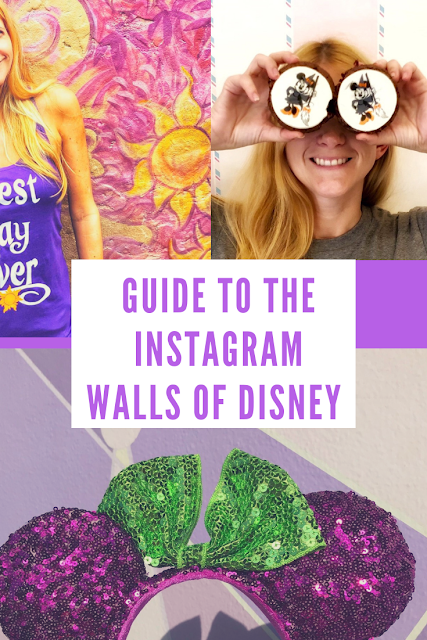 · When you have toddlers, paying $45 each for an outfit in a bag that they will only wear once is hard to stomach, especially when they are picky and won’t wear the entire ensemble anyway. · You can upgrade your current costume with fun extras from a wand, new accessory, hoodie, matching sunglasses etc. 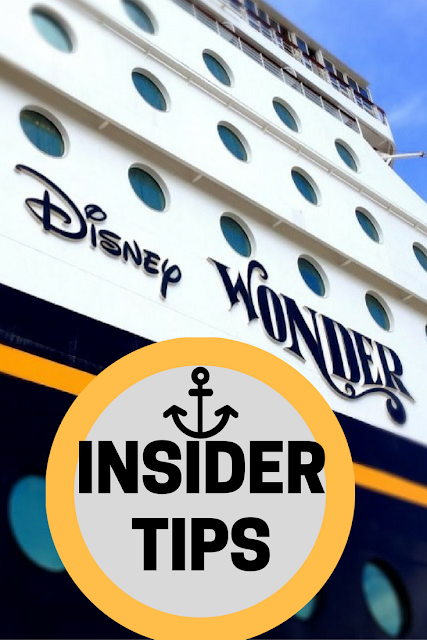 · When everyone is going as Elsa, this allows your child to be a little different than the one-size-fits all Elsa costume. 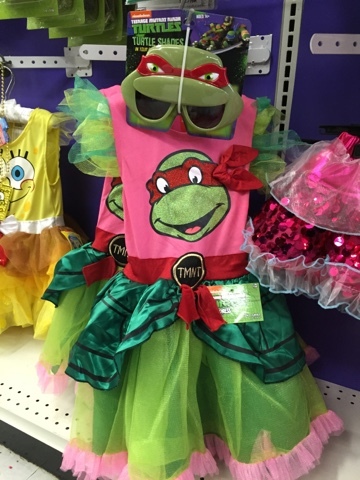 · You can mix and match, so why not be a Princess Ninja?! · You can utilize stuff you already own and just plus it up. Already have a Captain America t-shirt, just pick up the shield and you’re an Avenger. · Depending if you live up North or down South, the ‘Make Your Own’ section has options for both cold and warmer weather. Being down in Florida this is great, since the outfits in the bag are usually too warm or bulky for October here. Plus, numerous genres had winter hat and tight accessories to keep you warm for colder Halloween nights too. 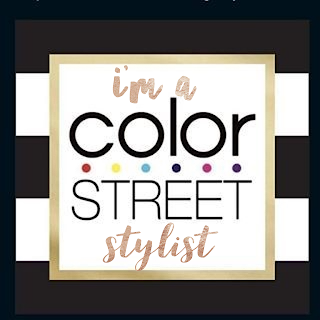 · It’s not just for kids, they have the same characters with adult options too. · They have boy and girl options for even the typically male characters. They had adorable TMNT, Sponge Bob, Minions and Batman costumes for girls too. And you guys looked so perfect at the Halloween party! Awesome party city discount through Chuze.